"Ukraine Airlines" redirects here. For other uses, see List of airlines of Ukraine. Ukraine International Airlines (UIA), PJSC (Ukrainian: Приватне акціонерне товариство «Авіакомпанія Міжнародні Авіалінії України» (МАУ), Aviakompaniya Mizhnarodni Avialiniyi Ukrayiny, [ˌɑwijɑkɔmˈpɑɲijɑ miʒnɑˈrɔdɲi ˌɑwijɑˈʎiɲiji ukrɑˈjɪnɪ]) is the flag carrier and the largest airline of Ukraine, with its head office in Kiev with its main hub at Boryspil International Airport. It operates domestic and international passenger flights and cargo services to Europe, the Middle East, the US and Asia. Ukraine International Airlines Boeing 737-500 preparing to depart Istanbul Atatürk International Airport. The airline began cargo operations with a Boeing 737-200 aircraft on 13 November 1994 to London and Amsterdam, and today operates a Boeing 737-300F as a dedicated aircraft for freight operations. In 2000, the European Bank for Reconstruction and Development became a shareholder by investing $5.4 million. In 2006 UIA adopted a new classification system for freight operations which allowed the airline to carry a wider range of goods, ranging from live animals to fresh food and valuable objects. Additionally, an express service was introduced to meet the needs of customers wishing to make use of expedited cargo delivery services. The owners are represented by Aron Mayberg, a business partner of Igor Kolomoyski and the former CEO of the bankrupt AeroSvit-airlines, from which partially licences and planes were transferred to Ukraine International Airlines. In the first half of 2013, the airline's traffic rose by 60% to 7006220000000000000♠2,200,000 passengers. 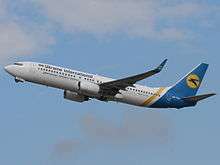 According to the company's president Yuriy Myroshnikov, the UIA planned to achieve the same 2013 yearly results (i.e. to reach yearly traffic of 7006440000000000000♠4,400,000). On 25 April 2014, UIA began non-stop flights from Kiev to John F. Kennedy International Airport in New York City. In 2013, due to the demise of competitor Aerosvit, UIA launched new flights from Ukraine to Baku in Azerbaijan, Yerevan in Armenia, Larnaca in Cyprus, Munich in Germany, Warsaw in Poland, Vilnius in Lithuania, Prague in the Czech Republic, Athens in Greece, Batumi in Georgia, Moscow (Sheremetyevo Airport), Yekaterinburg, Saint Petersburg, Kaliningrad, Nizhnevartovsk, Novosibirsk, Rostov-on-Don, and Sochi in Russia, Bishkek in Kyrgyzstan, and in 2014, New York City in the United States. In October 2015 UIA was banned by Russian government from flying to Russian destinations as a response to a ban by Ukrainian government of Russian airlines from flying into Ukraine. Like lowcost-carriers UIA doesn't offer free catering on board excepting a free glass of water. However, passengers may order prepaid meals. At 14.06.2016 the offices of UIA were searched because of an investigation of the National Anti-Corruption Bureau of Ukraine concerning not paid passenger fees to State Aviation Fund. The ownership-structure per 22/6/2016 is registered as following: 74,1627% Capital Investment Project, Ukraine and 15,9108% Ontobet Promotions Ltd, Cyprus. UIA connects Ukraine to over 70 destinations in Europe, Asia and the Middle East, as well as to New York City, from its base at Boryspil Airport, and also operates domestic flights. UIA serves over 700 flights per week and provides connections with its international partners’ flights to more than 3,000 other destinations across the world. Operated from November 5th, 2016 to April 5th, 2017. Boeing 737-300 3 — var. 148 To be retired by 2018. Boeing 737-800 17 2 var. Boeing 737-300F 1 — Maximum payload: 19 tonnes. ↑ "IATA - Airline and Airport Code Search". iata.org. Retrieved 11 April 2015. ↑ "UIA Management Team - Ukraine International Airlines (UIA)". Retrieved 24 April 2015. ↑ "Contact Ukraine International Airlines." Ukraine International Airlines. Retrieved on 21 June 2010. "ADDRESS: UKRAINE INTERNATIONAL AIRLINES 201-203, Kharkivske Road, Kiev, 02121, Ukraine"
↑ "Ukraine International Airlines launches direct Kyiv–New York flights". KyivPost. Retrieved 24 April 2015. ↑ "UIA now under control of Cyprus based Ontobet Promotions". ch-aviation. Retrieved 26 July 2013. ↑ "List of shareholders of UIA (in Ukrainian)". Ukrainian state register of shareholders. Retrieved 26 July 2013. ↑ МАУ похвасталась ростом пассажиропотока и планами начать полеты в США. Korrespondent.net (in Ukrainian). UNIAN. 26 July 2013. Retrieved 15 September 2013. 1 2 "UIA opened ticket sales for Kiev – New York non-stop scheduled service". Ukraine International Airlines. Retrieved 2014-02-23. ↑ Archived 29 April 2014 at the Wayback Machine. ↑ "Profile on Ukraine International Airlines". CAPA. Centre for Aviation. Archived from the original on 2016-11-03. Retrieved 2016-11-03. ↑ "Archived copy". Archived from the original on 21 May 2011. Retrieved 2011-04-07. ↑ "Ukraine International Airlines Fleet Details and History". Retrieved 24 April 2015. ↑ "МАУ задействует дальнемагистральный Airbus A330 на своих рейсах". Retrieved 31 October 2016.